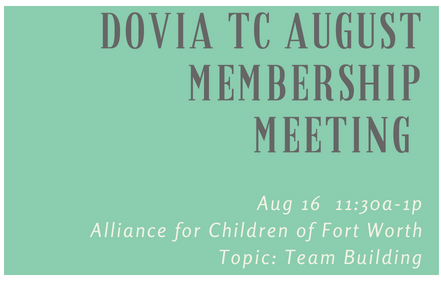 It is time to register for the August Membership Meeting. Must register by August 14. This months topic is: "Team Building". Join us to learn new ideas for building your team of employees, volunteers, or both! This month's host is Alliance for Children-Fort Worth. Their location is 908 Southland Ave, Fort Worth, 76104. Right in the heart of the medical district. Parking is limited. Consider carpooling. There is metered parking on the street, be sure to have quarters available.